I know what you’re thinking – I thought it, too! “I’m not a crazy cat/dog person! 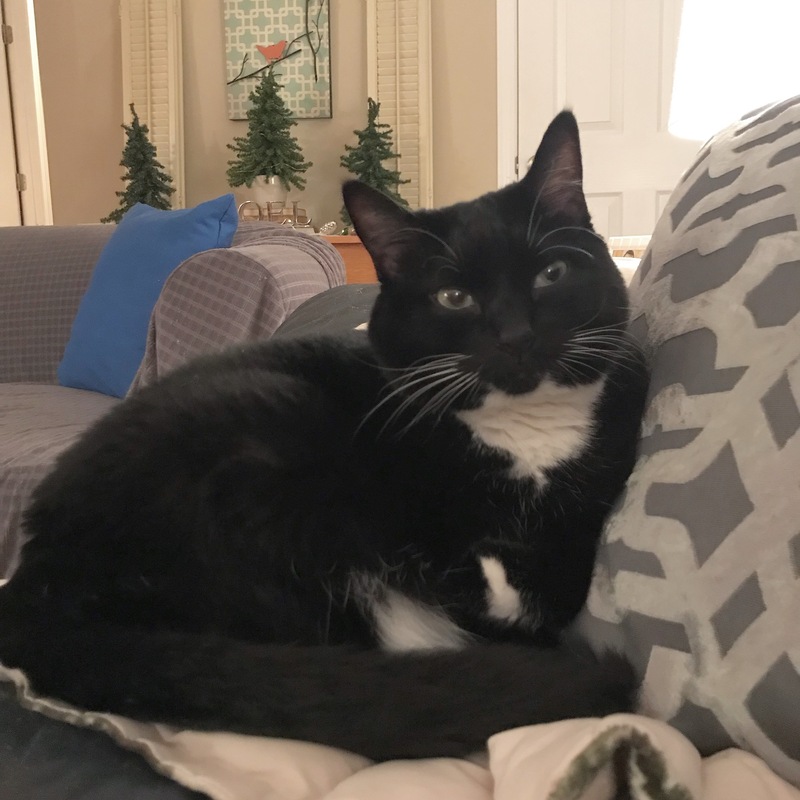 I don’t need to pay someone to watch my pets!” The thought of hiring a pet sitter had never crossed my mind – until recently. Having two indoor cats, I only need someone to check on them if we’re gone more than 24 hours. For the past couple years I traded off pet sitting with my neighbor who also had two cats. When they moved earlier this year, I was forced to find a different solution. 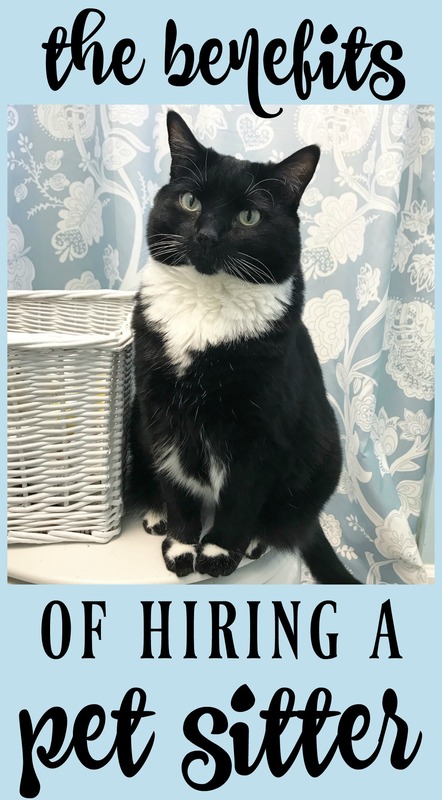 At first the idea of paying a stranger to check on my cats seemed so out of reach (and a little #extra), but it wasn’t long before I changed my mind. A Google search for pet sitters in my local area eventually led me to Cuddly Critters Pet Sitting. I dialed their number and within minutes my mind was at ease! 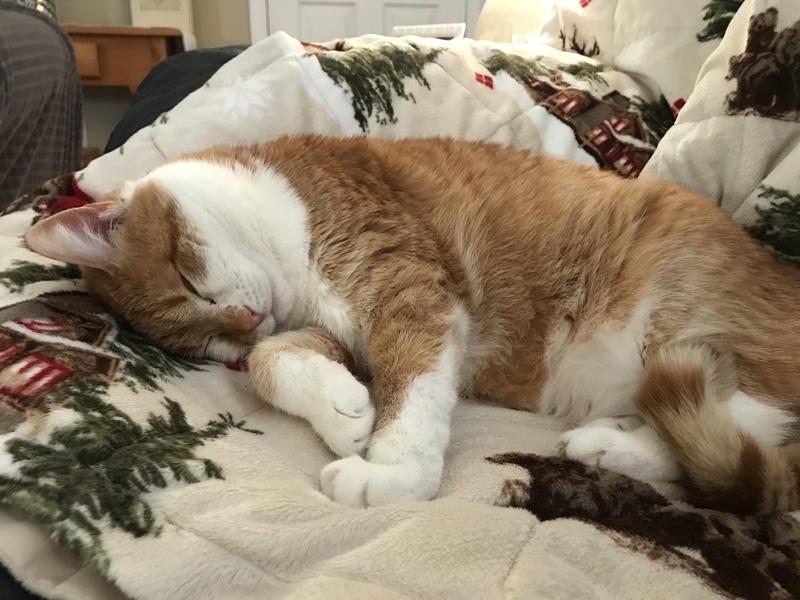 Hiring a pet sitter through Cuddly Critters was the best option for our needs while we were out of town over Thanksgiving weekend. It was a great experience! Here are three perks of hiring a pet sitter! This is a big one for me. I always feel bad asking friends or family to clean up hairballs or to wipe up around the litter box! It’s a gross job, even for me. You can imagine my delight when during the tour of our house the sitter asked me to show her where I kept paper towels, carpet cleaner and even the broom. Our sitter was already familiar with the Tidy Cats Litter Breeze system that we use, which made my life easier. I was even more delighted when I came home to find the area around their litter box SO clean and fresh! Having someone play with the cats really benefits me because they are less likely to get into things they shouldn’t if they’ve expended their energy playing with a new friend! I never asked my friends or family to commit time for this when they checked on the cats – I knew they were already inconveniencing themselves just to stop by for a minute. Paying a sitter removes this pressure! Cuddly Critters guarantees that the sitter will be in your home for 30 minutes each day. That’s plenty of time to take care of the cats’ litter box and food needs plus an ample amount of play time. My sitter found a few of their toys and played with them, gave them attention and even texted me a few pictures in the process! Cuddly Critters’ contract requires that you list the information for your local vet and your wishes in the event of an emergency (or even death). It’s very comforting to know that if my cats got really sick, the sitter would be capable and ready to pack them up in their carriers and take them to the vet. It’s always wise to get references, read reviews and do your research before choosing a pet sitter. Cuddly Critters is on Angie’s List and is also a member of the Greenville Chamber of Commerce. After all, you are inviting a stranger into your home! I was able to meet the sitter in our home a week before we left. She took notes, played with my cats and asked questions to better understand my preferences for their care. I had a great feeling about her and was so pleased with her service! If you’re thinking about scheduling a pet sitter for Christmas, now is the time! Most services (including Cuddly Critters) charge a little extra on Christmas Eve and Christmas Day, but it’s worth it. Cuddly Critters Pet Sitting serves Greenville, Greer, Taylors, Mauldin, Simpsonville, Travelers Rest, Fountain Inn and other areas of upstate South Carolina. If you’re in any of those places – call Corinne and schedule a consultation with a pet sitter today. You can request an appointment here, or call them at (864) 901-3189. 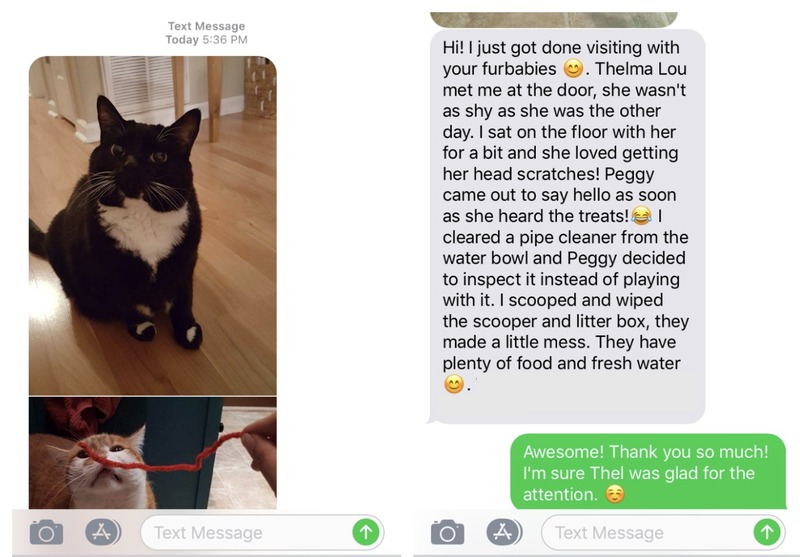 My experience with their cat sitting service was tremendous, but they also offer dog walking and exercising as well as daytime and overnight boarding for dogs and cats. Check out their website and Facebook page for all the details, rates and information! Thank you! Glad to have you here! Ugh, I’m sorry you’re losing your kitty sitter! I bet you can find something similar in your city – there were a couple options here in Greenville. Good luck! Wow, you ARE a good friend! I don’t blame you – litter boxes are not fun. That top pic of Thelma Lou is so pretty!! But then they’re both always adorable!